NO new iPad Pro will be introduced today. Apple’s event starts at 10AM this morning. Noted analyst Ming-Chi Kuo, known for pretty reliable Apple rumors, has dropped a few today, ahead of the Apple rollout Wednesday. According to macrumors.com, Kuo says Cupertino will replace Lightning with a USB-C port on the upcoming iPad Pro. The new iPhones will have 5W power adapters…not the rumored higher wattage ones. The new, cheaper MacBook will have TouchID but won’t have a Touch Bar, and the Watch 4 will all have a ceramic back and support EKG in addition to a thinner bezel and bigger face. As for the iPhones, Kuo thinks the new 6.1” one (which will ship late September or early October) will account for 65-70% of the new iPhone models shipped. We’ve been hearing that Ford is aiming to drop all sedans save the Mustang, and focus primarily on SUVs and pickups as they move to electric vehicles. Now, that automaker has teased an electric performance crossover SUV codenamed the ‘Mach 1.’ Theverge.com reports that Ford has increased its investment in EV tech to $11 billion. 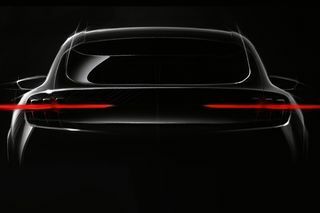 Note that in the teaser image, the tail lights mimic those on the original Mustang. AT&T has announced they are adding 5 more cities to their 5G network by the end of the year. Houston, Jacksonville, Louisville, New Orleans, and San Antonio will join the 7 cities already announced: Atlanta, Charlotte, Dallas, Indianapolis, Oklahoma City, Raleigh and Waco. Waiting to get the faster service until early 2019: Las Vegas, Los Angeles, Nashville, Orlando, San Diego, San Francisco and San Jose. The carrier is also working on its Project AirGig, which is designed to cover rural populations that don’t have access to high speed internet. They will apparently roll out cheaper plastic antennas that can be mounted on existing poles, buildings, etc to increase coverage. After yesterday’s preview of iOS 12 at Apple’s WWDC, some techies have noticed changes that indicate that the upcoming refresh of the iPad Pro will have Face ID and no home button. Macrumors.com reports that the higher line iPads will also get gestures that match the iPhone X, like swiping up from the dock to open the home screen, and a swipe from top right to open the Control Center. Since no hardware was shown at WWDC’s keynote, most analysts think freshened iPads and maybe MacBook Pros may come later in the fall, after the iPhone rollout in September. It looks like Google will be following Apple in adding a 3rd phone to the Pixel line with the Pixel 3’s. According to bgr.com, there will be a Pixel 3 and larger Pixel 3 XL, as expected, but also a cheaper Pixel 3 version…probably coming in 2019, which will run a midrange Snapdragon 710 processor instead of the latest and greatest ones expected in the other Pixel 3’s. The cheaper model just went into development last month, but should be out the first half of next year. First we got the MacBook Pro with the semi-useful ‘Touch Bar.’ now Asus has introduced the ZenBook Pro with a 5.5 inch touch screen in place of the touch pad. Although kind of gimmicky, the touch screen may be more useful overall than Apple’s Touch Bar. Theverge.com says it adds, rather than taking away features from the keyboard. The touch screen can be used as an app launcher, calculator, calendar, or numeric keypad. You can even play back YouTube videos via a Chrome extension. Asus has partnered with Microsoft, and you can get access to Word, Excel, and Powerpoint shortcuts and adjustments via the pad. It hits the market the middle of next month starting at $2299. Firefox has released a pilot of some features. One is a Theme Editor that lets you choose colors and even textures and background….if you happen to be very OCD about your browser. The other feature reported by techcrunch.com is pretty cool if you’ve used a later model iPad. With the iPad, you can pull in another window and run a second app, switching between the two…I have found this handy with social media like Facebook and a slide over of my Twitter feed. Firefox is piloting Side View..you can use a widescreen monitor and display two tabs side-by-side inside the browser without having to open a second Firefox window. This can be very handy…here’s hoping they make it a standard feature. Apple is going all-in on Face ID. The iPad Pro will get it in 2018, according to a Bloomberg report picked up by 9to5mac.com. The top line Apple tablet will also get an improved Apple Pencil, and smaller top and bottom bezels, but no OLED screen, which could be quite pricey on a 12.9 inch device. Just a couple days ago, there was a report that Google was working on an answer to Apple’s AirDrop over Android, which allows sharing between devices nearby that are connected via WiFi or Bluetooth. Now, theverge.com reports that Microsoft has begun testing its own similar system called ‘Near Share’ for Windows 10 devices. It’s available now on the latest Insider build of Windows 10, and makes sharing documents or photos to nearby PCs virtually seamless over Bluetooth. Redmond is also adding a mute tab to the Edge Browser. Amazon has brought out its own sound bar for under $100 under the AmazonBasics line. Bgr.com says the $94.99 system works over Bluetooth, and has a built in subwoofer. It has 3 sound modes: Standard, News, & Movie, plus its own remote (it’s not compatible with universal or TV remotes.) If you want to spring for a few bucks more, and get a sound bar with a REAL, 6” subwoofer, check Amazon’s deal on the Klipsch Reference Series R-4B, for just under $150 while supplies last. It’s looking like Apple’s 2018 iPad Pro models will have a True Depth cam and support Face ID. Macrumors.com reports that KGI Securities sees the features migrating over from the iPhone X. The system will only be on the Pro models, not the other iPads. A lot of us can remember when Apple’s Mac had 3% or 5% of the PC market. According to a new survey picked up by appleinsider.com, that puny penetration is not Apple’s problem in the US anymore. The CNBC All-American Economic Survey finds that 64% of all Americans own an iPhone, iPad, Mac, Apple Watch, or iPod product! Not only that, the number of Apple products in active use has gone from 1.6 to 2.6 products per household. If you think Apple stuff is a little rich…you’re right…87% of households claiming an income over $100,000 have at least one Apple product. Samsung strikes again….strikes a deal on processors, that is. Bgr.com says they have inked a deal with Qualcomm to have an exclusive on the upcoming Snapdragon 845 chip for the Galaxy S9 and S9+. In addition to getting the jump on other Android makers with faster silicon, Samsung will allegedly roll out the new handsets a month earlier…probably in February 2018, but some rumors say they will drop even before Mobile World Congress…maybe in January. Samsung rolled out its latest Galaxy phones, the S8 models, without the virtual assistant Bixby in the US. It was due by now, but has been delayed a month. The Wall St. Journal reports that they are having trouble getting it to understand English syntax and grammar. Virtual assistants haven’t been the ‘killer app’ on smartphones anyway…only about 9% of users use the AI feature on a regular basis, according to research firm Ovum. Half of smartphone owners either had no interest in the feature or didn’t even know about it. It has been a different story with talking speakers, which the public seems to be accepting more quickly….with Amazon’s Alexa and the Google Assistant in the lead. There are armies of people digging through regulatory filings around the world to bring you tidbits like this: a Russian filing points to 5 new Macs and 4 new iOS devices on the way from Apple. According to apple insider.com, we could see some rolled out at WWDC. There has already been speculation that Apple would show a new mid-sized iPad Pro at WWDC, fitting in between the 9.7 inch and 12 inch iPad Pros. A recent shortage of MacBooks seems to point to a refresh of MacBook Pros and Airs as well.